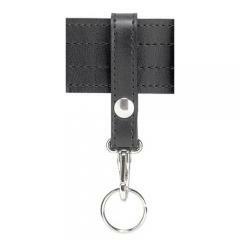 A heavy duty spring hook holds your keys firmly in place, yet allows for easy removal when you need them. Fits belts up to 2.25" wide. 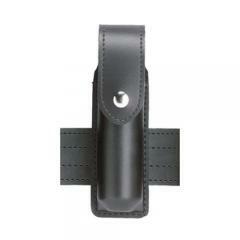 This is a standard mace holder with a top flap for added security. Available in plain, basketweave, gloss or nylon look finish. NOTE: First Defense MK-9 Magnum option not available in hidden snaps. 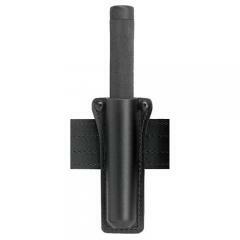 The Safariland Police Baton Holder is designed for expandable baton carry. This expandable baton holder features heavy duty Safari-Laminate construction. Available in five different finishes. Rugged, durable Safari-Laminate formed radio pouch features an adjustable bungee-cord tie down and snap closure. 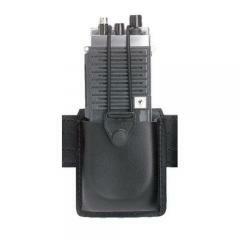 Available in four sizes to fit most police radios. 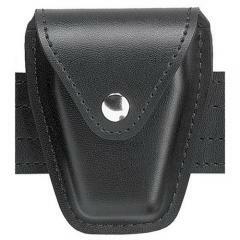 Standard top flap handcuff pouch. Holds one pair of handcuffs. 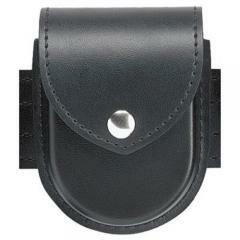 This Safariland handcuff pouch is designed for use with belts up to 2.25" wide. Available in plain, basketweave or gloss finish. 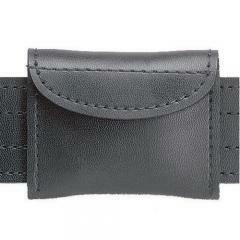 Standard top flap handcuff pouch. Holds two pairs of standard sized chain securely. For use with belts up to 2.25" wide. This is Andre DaSilva for Cops Plus. Today we're going to break down the duty rig and go over the different components. For those of you new to law enforcement, all this gear can be a bit overwhelming, but it's actually straightforward once you know how it all goes together. Duty gear is available in four different finishes typically decided by your department. Plain, basket weave, hi-gloss, and nylon. The first one I want to show you is the simplest of the four. It's a plain, leather finish. As you can see, it's smooth without any texture. This is a popular choice for law enforcement. The next one we have is similar to the plain, except this leather finish has a basket weave texture stamped into it. Also a popular choice. Another finish we have is called hi-gloss, also known as clarino. This more formal gear is used on highway patrol and mounted police officers. Finally, we have nylon. This lightweight option is often used by officers in warmer climates. A duty rig consists of two belts. The first one is called a garrison belt and it works just like a standard pants belt. The second one, this is your duty belt. 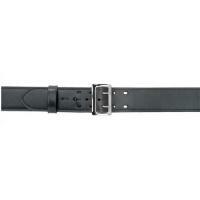 This is where all your gear attaches to and it's also called a Sam Browne belt. How these two belts work together we'll get to in just a minute. Here we have all the cases and holders that attach to your duty belt. Generally, these cases and pouches come in different sizes to accommodate different kinds of equipment. First off we have a radio holder. This is how it attaches to your belt. It also features a strap that keeps your radio in place. 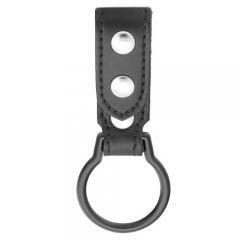 Next off we have handcuff holder. This holds a standard pair of chain link handcuffs and this is how it attaches to your belt here. Next we have a double handcuff pouch. Although it can be a little bulky, it's convenient to have two pairs of handcuffs. Next we have an OC spray holder. This one features a top flap which keeps your spray in place until it needs to be deployed. Next we have a double magazine pouch. This also features a top flap and a retention screw to keep your magazines in place. The neat feature in this one is it has two different belt slots - one for horizontal and one for vertical mounting. Next we have a flashlight holder. This one happens to be an open top. It is available with a top flap to keep it in place and it comes in different sizes for various model flashlights. This one here is a baton holder. This one features two retention screws to keep the baton in place until it needs to be deployed. Next we have the ring style flashlight holder. These can be used to hold the larger Maglite flashlights as well as the older style wooden batons. Next we have a key holder. This loop attaches to your belt and snaps on. It features a spring loaded clip to clip your keys on. Next we have a silent key holder. This features a top strap that holds the keys in place and the velcro flaps fold over the keys keeping them quiet and secure to prevent them from rattling around when you're moving. Finally we have a latex glove pouch. This pouch holds two pair of latex gloves and that's a great option for officers on duty. Now let's see how this all fits on your duty belt. The first thing you have to do is remove the buckle from your duty belt. In order to do so, you have to fold the belt in half, lift the prongs, slide the buckle down, and off the belt. Let's start with the magazine pouch. I'm going to go ahead and remove the clips, so make it easier to install. What we want to do is feed the belt through the loops and slide it right out. I'm going to go ahead and install the rest of this gear so you can see how the belt is configured. Here's your complete duty rig. You have pouches for your magazines, baton, flashlight, radio, handcuffs, surgical gloves, pepper spray, and keys. Let's not forget your duty holster. 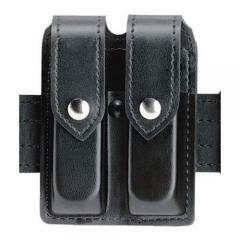 The 6280 made by Safariland is a very popular choice among law enforcement. 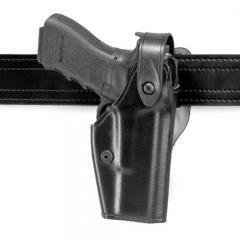 This is a level two duty holster. The level two refers to the two retention mechanisms. The retention screw and the forward rotating hood. There are two belt loops. Slide the belt easily right through. Here we have a complete duty rig. Let's talk about how you wear this rig. 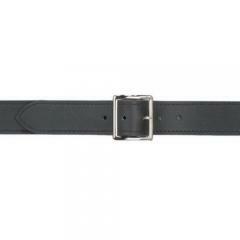 At the beginning of the video I talked about the garrison belt that you wear like a pants belt. The way these two attach to each other is by using what we call belt keepers. Typically you use four. I'm going to show you how to attach these. Once all four keepers are in place, your duty rig is securely fastened to your garrison belt and you're ready to roll. I'm Andre DaSilva for Cops Plus. Make sure you check out our other videos. Thanks for watching and stay safe out there.